On Sunday, I was honored to present a House citation to Paul Belak at his Eagle Scout Court of Honor ceremony. 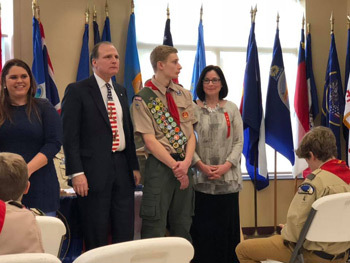 Paul, the son of John and Eileen Belak of Bridgeville, is a member of Troop 4. For his Eagle Scout project, Paul constructed four benches for an outside classroom and a lending library at St. Louise School. Congratulations! Additionally, I host a service officer from the American Legion at my district office in Bridgeville on the first Thursday of each month. The officer can help with compensation, pension, death benefits, education and health care, as well as any issues pertaining to veterans benefits or the U.S. Veterans Administration. Please call my office at 412-221-5110 to schedule an appointment.